Happy Cyber Monday! How was everyone's Thanksgiving? This week Harry Potter leaps to the top spot on DVD, while Toronto-native Drake's new album reigns supreme over all the latest holiday albums. *The New York Times has yet to update their Fiction and Nonfiction lists for this week, so the lists shown in this post are last week's lists. Last month, we reported that Amazon had agreed to allow public libraries to lend e-books for its popular Kindle e-reader. Now Amazon has gone a step further, bypassing libraries and allowing Amazon Prime subscribers to borrow books for their Kindles directly from Amazon. Naturally, this has produced a wide range of reactions. It seems from here that libraries are safe from Amazon’s lending service, but what do you think? Have you heard comments from library users who own Kindles about e-book availability through the library or from Amazon itself? Let us know in the comments section below. Turkey Week kicks off with some hot debuts. Mac Miller takes the top spot on CD. Don't know who Mac Miller is? Stephen King's new book and The Change-Up also debut at number one. Meanwhile, not even Bill Clinton's new release can dethrone Steve Jobs. When you say the word “library,” some people will think only of books. While books are definitely a central part of the experience, frequent visitors know that the library has so much more to offer than that. Truth is the library is many different things to many different people. Let’s take a look at some of the different reasons people love going to the library. Multimedia offerings. Yes, there are books. And not just physical ink-and-paper books; there are also audiobooks and e-books. There are newspapers and magazines. In addition to all the reading material, there are also DVDs and CDs. Some libraries even offer video games. So wherever your interest lies, you’re sure to find something you like at the library. Browsing. The library makes it extremely easy to find exactly what you’re looking for. You can get online, search for the item you want, and reserve it, then just go pick it up. But, as Virginia Tech professor Brian Romans notes, there’s a lot to be said for spending some time just browsing and coming across something completely unexpected. Cost savings.1 All the items the library offers are available for checkout. Why pay upwards of $20 for the latest hardback bestseller when you can borrow it from the library? You can also check out an audiobook for a long car trip, see the latest movie release everyone is talking about, and explore new music—all for free! That’s something everyone can get behind, weak economy or not. Job searching. Speaking of the economy, the library offers plenty of resources to help those looking for work. From books with tips on writing a résumé to computers to write it with, the library is a great asset. Social networking. No, I’m not talking about Facebook and Twitter, but actual face-to-face human interaction. Libraries are community hubs, offering many clubs and activities or meeting spaces for outside groups. It’s a great place to get together with friends or meet new ones. There are any number of other reasons to love going to the library. Speaking for myself, I visit my local library at least once a week. I love the smell of the books and being surrounded by them. I also enjoy being able to check out music by artists I’m not familiar with. How did you fall in love with the library? What do your patrons rave about? Let us know in the comments section below. The Glass City rolled out the red carpet for the 2011 Ohio Library Council Convention and Expo. The convention took place October 26–28 in Toledo, Ohio, at the Seagate Convention Centre and Park Inn Hotel. The cold and rainy weather couldn't dampen the event as over 120 vendors were on display and show attendance soared. Midwest Tape was excited to have the event in our own hometown. This is one of the longest running conferences that we exhibit at, and it is a great place to showcase how our company continues to evolve over time with state-of-the-art products and services. Not only did we exhibit, we were also a Gold Star Sponsor. Midwest Tape Sales representatives Erin Horne and Mike Riedeman worked the booth throughout the three-day show. “The conference allowed me to connect with established, long-time customers in my territory as well as meet new faces from public libraries around Ohio,” said Erin Horne. In between workshops or author speaker sessions, attendees walked the trade show floor, visiting with vendors. “Several attendees stopped by to learn more about Midwest Tape offerings. Many just wanted to say how much they enjoy working with us,” Erin said. This year, OLC decided against the standard banquet in favor of an all-convention reception at the Toledo-Lucas County Main Library. Midwest Tape proudly sponsored the event, which included live hot jazz, light fare, dessert, coffee, and a cash bar. The reception also included a chance for attendees to tour the Main branch, enjoy the Friends of the Library store, view the Mazza exhibit Speak! in the Gallery, and catch up with colleagues. We would like to say a big “thank you” to the Toledo-Lucas County Public Library and the Ohio Library Council Committee for making this such a successful event. We look forward to seeing everyone at the 2012 Convention! 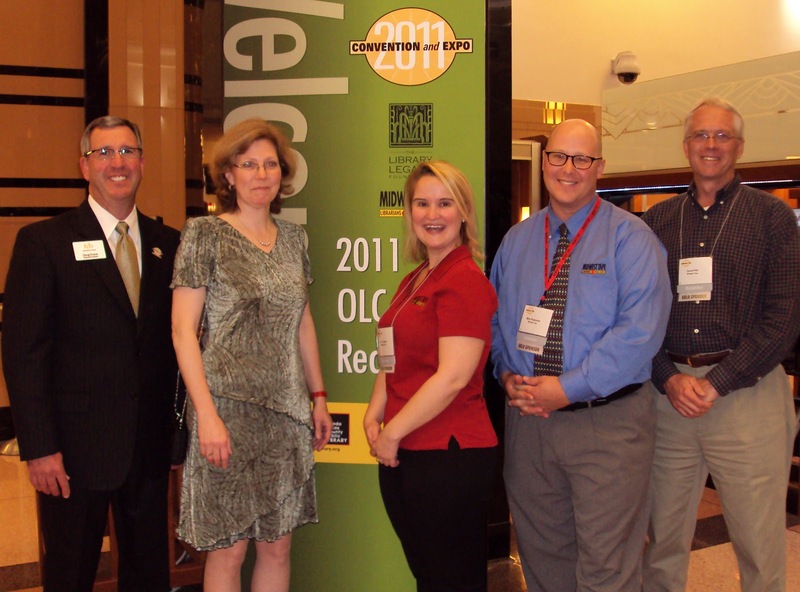 Doug Evans (OLC), Meg Delaney (TLCPL and Convention Chair), Erin Horne (Sales, Midwest Tape), Mike Riedeman (Sales, Midwest Tape), and David Pett (Director of Marketing, Midwest Tape) are all smiles at the convention. The clocks may have fallen back, but Coldplay didn't. Their new album hit number one on the CD charts immediately upon its release. Meanwhile, Captain America and Stranger Tides are both battling for the top spot of DVD. And while Steve Jobs reigning supreme in Nonfiction is no shock, 1Q84 rocketing to number two in Fiction is quite the nice surprise for this literature lover.